FORT MILL, SC ? The Nation Ford High School Marine Corp JROTC was named the Region?Two 2016?2017 Outstanding Unit of the Year. This national award comes immediately?after the program was designated a Naval Honor School, standing in the top 20 percent of?all high school Marine Corps JROTC programs in the United States and territories. 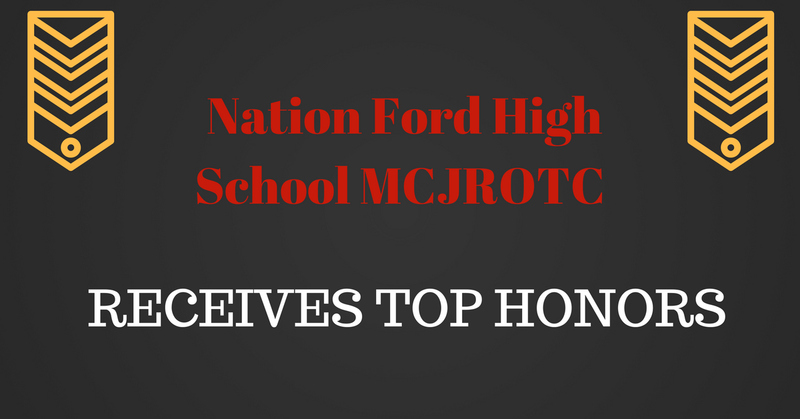 This is?the second consecutive year and the third time in the past four years the Nation Ford?MCJROTC program has received this honor. Region Two consists of six states: Alabama, Florida, Georgia, North Carolina, South?Carolina and Tennessee. All MCJROTC units submit an annual report in June regarding the?cadets? and program?s accomplishments throughout that school year. Points are awarded?in 10 categories and then reports are compared to other schools to determine the awards. The Fort Mill High School MCJROTC program was also designated a Naval Honor School for?the 2016?2017 school year. The mission of the MCJROTC is to develop cadets into confident and upstanding citizens?within our community through volunteerism, hard work, and goal-oriented tasks.